The City of Spokane Street Maintenance Division is responsible for cleaning, repairing and performing preventative maintenance on the 2,200 lane miles of paved streets and 61 lane miles of gravel streets. 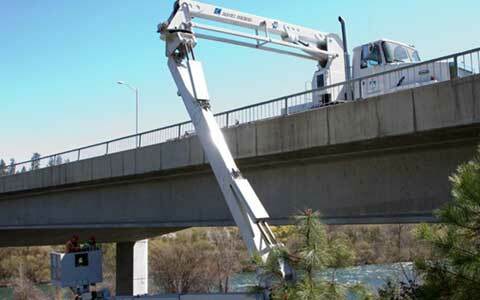 The City Bridge Division inspects and maintains 66 bridges, which includes 43 vehicular and 23 pedestrian. The records of the inspections, maintenance activities, load limits and any design plans are filed in the Bridge Office. An additional 63 bridges are inspected and reports provided to the owners, these include the downtown skywalks and the railroad bridges. The City's bridge inventory is maintained as prescribed by the US Dept of Transportation, Federal Highway Administration (FHWA). The FHWA establishes the standards for bridge inspection and maintains the National Bridge Inventory (NBI), a database of all the bridges in the Country. All bridges are inspected on a regular schedule, typically once every two years and the information is forwarded on to the FHWA, who maintains it.